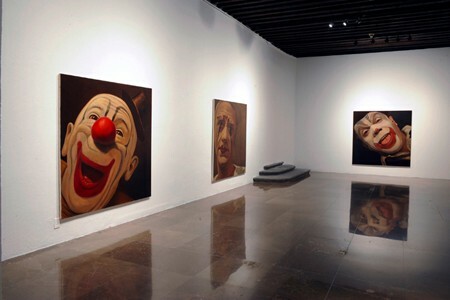 Yishai Jusidman, The Clowns (1991-93), installation view in “Yishai Jusidman: Pintura en obra / Paintworks” at Museo Amparo, Puebla, Mexico, 2009. The exhibition is currently on view at Museo de Arte Moderno in Mexico City. Over a year ago, while Yishai Jusidman was preparing for a major survey exhibition of his work, which is currently on view at the Museo de Arte Moderno (MAM) in Mexico City, I had an extended email exchange with the artist about his artistic process and practice. At some point, our correspondence was contemplated as a dialogue piece that could be included in that exhibition catalogue. But both Yishai and I had disagreements—of the good kind. At the heart of our quarrel was how to interpret his work. In our exchange, we discussed art theory and art schools, aesthetics and semantics, the use of reference and the self-referential in contemporary art. While I pressed on social context to approach his painting, his insistence was on aesthetics. After a couple of months and over five thousand words exchanged, we parted ways. It was only until some weeks ago, that we informally chatted and reconsidered the dialogue again, this time not with the purpose to expand it, but simply to publish. I believe this dialogue with Yishai is interesting for several reasons. On the one hand, the piece is quite personal without being coded in private language, and as such allows for a more intimate view of his work. On the other hand, the dialogue is grounded in contemporary debates about methodology, as it informally unpacks different yet synchronic approaches to making and interpreting art today. — Exactly ten years ago, I was visiting Mexico City, and I called you to meet at your studio. I had been to that city many times before, but this time as an art history student interested in meeting artists and learning about artistic processes outside academia. We had only met some months earlier, during your visit to the public art exhibition inSITE97, where I was interning at the time. You were there with curator Maria Guerra, who sadly passed away some years later, and were planning to write about that exhibition for Artforum. I remember the day perfectly, as if it had happened only months ago. Maria and you spoke about the exhibition thoroughly. She was interested, if I am not mistaken, in the story behind Daniela Rossell’s project—a monumental molar found somewhere deep in the Pacific ocean of that region. And you, I remember, spoke of your admiration to the painterly aspects of a video installation by Judith Barry, something that you later developed in that exhibition review. At your studio, in Mexico City, the conversation continued being about painting, this time your own. You had been working on what later became known as the first body of work of en.treat.ment, a series of portraits depicting mental patients. Each of the portraits would have an object label, you explained, and showed me some completed ones and others in progress. In comparison to the portraits, the so-called object labels were relatively small text-based paintings. Each of these described the protagonist’s medical condition, followed by the caption of the artwork rendered on the open book page over their lap. I was interested in learning about the processes involved in getting the patients to participate with you on this project—the ethics, the bureaucracy, the dynamics between artist and model. Instead, your emphasis was in describing your interest to explore a kind of self-referentiality in painting, and to playfully introduce the different places and moments of observation involved in and with painting. I want to begin this dialogue with getting a sense of where and how your interest in painting emerged, and how the early works in the series of en.treat.ment follow an earlier investigation of painting within painting, which seems you first explored with using geishas and clowns as your protagonists. — I also remember fondly that afternoon with María; the three of us sitting on the deck of a restaurant on San Diego bay, schmoozing as usual about our artist friends and enjoying the view of huge carriers floating before us. InSite97 was pivotal for the artists of my generation in Mexico City. There were projects by Daniela Rossell, Eduardo Abaroa, Tommy Glassford, Melanie Smith, Francis Alys, Rubén Ortiz, Abraham Cruz Villegas and Sofia Taboas; it was the first time they showed together at an international event alongside top rated talent of the time, and a sense of camaraderie and shared optimism permeated the occasion. A consequence of the post-modern insistence that “form follows purpose,” that my interest in X precedes and defines my making artwork about X, is that one is persuaded to choose to be an artist (and one’s purpose as such) before engaging in any particular media. But when I was growing up in Mexico it was still assumed that one’s interest in the visual arts arises from engaging in drawing, painting, sculpture or (less archaically) photography or film. Thus one would adopt a craft, cultivate one’s skills, and eventually use those skills as means of artistic expression. Insofar as I painted since I was a kid, when confronted with the above post-modern conundrum in art school it became clear to me that, rather than exchange painting for a more pertinent and purposeful medium, I wanted to be an artist because I wanted to be a painter. Perhaps I should expand my answer by alluding further to my student years and those ensuing, during which several challenges mined the path to painting. While my more ambitious peers at Cal Arts schemed to usher the demise of late capitalism and short-circuit the semiotics of its visual superstructure (or something to that effect), I occupied myself by trying to emulate the delectable brushwork of Wilhelm de Kooning. But —those being the mid-eighties— the distressed figures I came up with were deemed to fall for the pseudo-gravitas of neo-expressionist rubbish. Such unwelcome and unintended reading of my work pushed me to reconsider my painterly options. I calculated that I’d be able to sidestep the psychologistic annoyances of expressionism by turning to landscape painting, and later on through an increasingly naturalistic approach to picture making. I believe I was correct on both counts, but in meddling with naturalism I came up against yet another taboo of the times. When I was fresh out of art school, the art world had fallen under the spell of deconstruction, and it had become an article of faith that our understanding and appreciation of works of art is entirely dependent upon socio-cultural conventions. Not only beauty and aesthetic value were posited as fictional constructs, but also epistemology and visual perception. Representation was reduced to a deception, a communal hallucination the artist should expose and undermine. For a budding landscape painter like me, however, the deconstructive iconoclasm swiftly led to a self-defeating cul-de-sac. One of my aims, henceforth, became to find subject matter that could serve as an effective anchor for a painting, such that the referential thread may not be dismissed as a whimsical extrapolation of the artist. In depicting through paint what already exists in paint, such as acknowledged landscape paintings and, later, the faces of clowns and geisha, I emphasized the material kinship between the depiction and the depicted, and thus the reference could indeed be objectively anchored. Of course I am making too pristine a sense out of a period that in fact was a lot messier and uncertain from within. It was a matter of learning to paint along the way of sorting out an environment intellectually inauspicious to my interests. — It’s clear that the years you studied in California where critical to the formation of new ideas about art’s political potential and a move away from “traditional” genre and forms of art making, such as painting. I think it’s important to consider how artists and institutions, such as Cal Arts, were directly addressing their socio-political context, whether it was in how they rendered or intervened that landscape. More to the point, I think that the political situation made it imperative for intellectuals to dissect beliefs and values, and to analyze the institutions that champion them, and the ways in which these are reproduced. Post-structuralism posited a new methodology for artists and academics alike, combing tools that could be drawn from history (as in social narratives) and psychology (as in personal desires). In that light, it was possible to analyze art making as one of many forms of cultural production, and thus of play with the formation of old and new values. I think you are being all too nice and diplomatic in your remark about the unwelcoming environment that you experienced; however, it’s difficult for me to see you as an outsider. I am tempted to consider your skepticism of deconstruction as a reactionary disavowal to the then emerging forms of artistic practice with an investigatory nature in areas of social history and, perhaps more pertinently, of art as commodity. You’ve given much thought to your choice of becoming an artist that paints, to painting as a practice about reasoning. Your own self-reflexivity and positioning regarding painting seems to be less a coming to terms with the medium, or say to competence of skill and truth to your desires, than of reasserting painting as a philosophical exercise. Is it accurate to call your artistic practice an investigation that is about making sense of painting and ultimately of the world? I want to go back to that first studio visit and speak again about en.treat.ment., since it brings the history of painting and an interest in psychology. It’s not only a beautiful body of work. I also think it’s memorable. And what I find most compelling is that this experience—a work making an impression in its viewer—is something that en.treat.ment is about. In an [unpublished] artist’s statement, you have written that this body of work is in dialogue with the common view that psychological properties can be attributed to artworks (and also, as if by extension, to their creators) in the very ways they are rendered. I want to know your criterion for selecting mental patients (a Foucaultian subject par excellence) as your models, as well as the range of art books you offered them—meaning, I’d love if you can give some facts, too, some purpose follows process follows form kind of thing. — I agree with you that our understanding of the art world and its milieu has benefited from the materialist/structuralist inquiry that has been the staple of departments of art history, comparative literature and critical studies for over thirty years. In art schools, however, the academic arguments on the political underpinnings of institutions and values have been adopted and revered as gospel, in turn causing art to be valued (and produced) there as either an illustration of fashionable speculations—such as deconstruction— or a surrogate of political activism. My own aversion to deconstruction is not of a political or artistic kind, and therefore not “reactionary” as you charge. I remain unimpressed by the school of deconstruction because the Sausurrian analysis of language—upon which the deconstructivist extrapolates a “critical methodology” that is meant to apply in every field of human knowledge— is fundamentally flawed when applied to visual representations. In regards to painting, Sausurre’s dictum that “The connection between the signifier and the signified is arbitrary” simply does not hold if only because color cannot be made sense of as an entirely arbitrary convention: It is not arbitrary that I paint a clear sky blue or the leaves of a tree green or a poppy flower red. It is arbitrary to do otherwise (although not necessarily senseless). Given my disenchantment with the theory that was preached in art school, I ended up searching for intellectual sources that could deepen my understanding of my interest in art and painting, of how come I am transfixed before a Vermeer or a Pollock. Again, I did not intend to subject my admiration and pleasure to a reproving critique (I’m happy to leave this to puritans, nihilists and revolutionaries), but to spell out those aspects of my interaction with an artwork that combine into an aesthetically moving experience. One’s experience of any good painting encompasses many facets of human experience: it incorporates one’s rapport with the material substrate of the world (through painting’s condition as crafted object); with language (through its condition as complex cultural artifact); and with the intentionality of a fellow individual (the artist). So, yes, the enjoyment of a painting can be understood as a philosophical exercise of sorts. As for the practice of painting, any decent painter thinks about these issues all the time: about the potential of the chosen materials, the participation of the work within a given context and about the artist’s motivation being conveyed through the finished artwork. Whether the artist’s engagement with his craft becomes patently philosophical is a matter of degree. And maybe I have immersed myself in these questions more than the norm. Still, I do not believe that profundity in art is directly proportional to the difficulty of experiencing it; so if my works end up being deemed profound, I hope they can also be readily appreciated as plain handsome pictures if it comes to it. You want to talk about the en.treat.ment series, right. I am glad it did make an impression on you. Any respectable work of art exists in order to make an impression on the viewer. You ask about my choice of portraying mental patients, and suggest a Foucaltian explanation is called for. I must confess I never read Foucault’s writings on madness. I did read The Order of Things (which I enjoyed immensely), and The Archeology of Knowledge (its revelations completely eluding my intellectual capabilities). My reasons for having chosen to paint mental patients are not grounded on the holy writ of the apostles of French theory, but on my overall strategic approach towards modern and contemporary painting. Painting’s detractors keep professing that the painterly clichés that remain of it have no relevance to the advancement of contemporary art. Within every cliché—including this one—there is a kernel of truth. Yes, the practice of painting has been stifled by tiresome formulae inherited from Romanticism and Modernism. For a painter, these clichés have become an inescapable concern. So, in order to engage the viewer, one must recognize and tame those clichés just as one must learn to use, say, color and composition. Among our prevalent art clichés, courtesy of the Romanticists, is the artist’s genius framed as folly—that the true artist is kind of a madman. Surely, some of our most overwhelming and original painters became clinically insane (from Goya to Van Gogh to Soutine to de Kooning). But by the early 1960s, the painterly look of mad geniality (exaggerated draughtmanship, brushstrokes or coloring) had become conventional and was exploited to exhaustion. Phillip Guston, a fine abstract expressionist in his time, turned to caricature to keep the intensity of his output at a peak. Indeed, we’ve learned to look for a level of psychological intensity in paintings, a strange thing to expect from an inanimate object, and the habitual explanation is that a painting functions as a window into the soul of the tormented artist. A painting is therefore only as interesting as the artist who made it. This is patently false. The minimalists reacted to this fallacy by advocating the complete objectualizing of painting, while Pop depersonalized painting by turning it into cultural merchandise. Nevertheless, we still desire to engage with paintings as we do with persons. We want paintings to communicate with us, we crave to make out their character and disclose their secrets. We see one as melancholic, another one as joyful, or enraged, or confused, or pretentious, or plain and boring. We may respect and admire some. We might even be humbled by one or two. But, again, the artwork should not be approached as a surrogate of the artist. And the en.treat.ment series is a direct attempt to advance this point, along with my other series on clowns and painters. I’ve explained in previous occasions that en.treat.ment was prompted in part by Velázquez’s Juan de Calabazas by and Morandi’s 1929 self-portrait. Both these paintings entice the viewer while eluding full disclosure of the portrayed. Having decided to tackle the subject of madness and painting by making portraits of mental patients, I searched in medical literature, but found no illustrations that would justify being translated into paint for my purposes. I figured I‘d have to find my own models, and looked into the possibility of contacting a mental institution. At that time I had received a grant from CONACULTA (the Mexican ministry of culture) to develop this project, and they helped me approach a state institution. After months of interviews, reviews, permit requests, consent and release forms being signed, I was allowed to work with patients who would agree to sit for me for a short photographic session, provided that their doctors and close relatives allow it. For the photo sessions, I had brought with me an array of art books I keep in my studio, mostly on painting. I believe I thought the books would allow for a more relaxed connection between the patients, the situation and me. Before sitting for the camera, I would ask each of them to look through the books and select a painting they particularly like and sit with the book open to that page. I hoped this would give them something to distract themselves with as I was shooting. I only thought of actually including the books in my paintings when I remarked in the photographs their choices and the way each one holds the book. As with the clown portraits, I decided I would place the figures in front of a neutral background (as a straightforward affront to the minimalist’s monochrome) and to counteract the expressionist’s hold on madness aestheticized by doing the portraits in a measured style, a modest scale, and using a technique reminiscent of pre-romantic painting. When the series progressed in the studio I realized that the interpretation of the rapport between the portrayed and his/her painting of choice would be metaphorically slippery. I happen to find the recourse to metaphor distracting and mystifying, so I decided to introduce an element that would make that rapport plain and direct. Based on the patients’ actual symptomatologies, the paintings they chose and their interactions with me, I proceeded to redraw their clinical diagnosis (with some professional help.) These are now fully spelled out in the title of each piece and were introduced in the hand painted museum labels that complement the portraits. Ultimately, I think, the psychological intensity generated by these works lies squarely between the spectator and the painting, and gets articulated through the interpolation of the restrained systems of representation thereby employed and the calculated invocation of a mindset that challenges clarity, logic and conformity. These paintings end up being deeply expressive without resorting to expressionism. I believe this may be something of a return to sanity for those of us in this side of the picture plane. — Your series of clown portraits has already been mentioned twice in this long-winded dialogue about art and philosophy. Indeed, if there is a figure that communicates emotion through exaggeration, whether it relates to a simple plot or task, and yet depends in the nonsensical act to offer a coherent meaning, it is the clown. In the paintings of The Clownspheres and afterwards in The Clowns, you focus primarily on the clown’s face and not on the narratives of an act or an entire costume. It is in the face that the use of make-up shapes exaggerated facial gestures to define the clown’s apparent emotional state. But while painted gesticulation defines a clown, it does so by deforming, transforming a human face with monstrous grins, inflated eyes, and so on, as if emotion is a matter not only of accent but proportion (or out of form). Suddenly, I feel your investigation on emotion with a series like en.treat.ment is possible only because of your findings in The Clowns. Can you speak about this earlier series of works? — Surely the en.treat.ment series owes a great deal to the foregoing clown series. A concern with the representation of emotion emerges frequently throughout my work, most recently in the Models series. In retrospect, this thread first surfaced with the clownspheres (1990-91) in a quite unintended way—hence my questioning of the “form follows purpose” premise. I had spent the four previous years doing landscape. Once I felt I had effectively fine-tuned the landscape-spheres in The Astronomer series, I decided to give portraiture a try in the same spherical format. For all I knew then, I may have been destined to be a painter of spheres; I was not envisioning yet working through distinct series. The logical follow-up to citing already existing paintings of landscapes would have been to transfer known portrait paintings on to the spheres, but the prospect of a Rembrandt-sphere seemed rather hokey. The idea of painting clowns attracted me insofar as I’d be correlating the pigment on a face to pigment on a sphere, thus providing the referential anchor I was preoccupied with at the time. But at that time, that post-history-yet-pre-internet limbo, it turned out to be very difficult to find the frontal pictures of clowns I needed. The best of New York’s libraries were of little help. My research led me to the Circus World Museum at the former Ringling Brothers winter headquarters in the town of Baraboo, Wisconsin. Only in its archives I did find a wealth of photographic material I could work from. A portrait depicted on a sphere cannot behave pictorially as a landscape on a sphere does. A real landscape surrounds the viewer, while the portrayed must be addressed face to face. In a landscape painting the pictorial space recedes towards the horizon line, while in a portrait the center of the painting is occupied by what is virtually closest to the viewer. The hybridization of portrait and sphere would require a new formal approach. From the outset I was aiming for something that could “work” pictorially. For a painter, why it is that something “works” and another doesn’t can only really be figured out a-posteriori. I know that I’ve put the wrong color because it shows; or the wrong line; or the wrong finish. I arrive at a formal solution by trial and error. (Yes, I may end up embracing error as a sort of provocation—as the Fauves did— or using the initial error to compound an alternative representational system—as did the impressionists.) Indeed, my first attempts at compounding portraiture and sphere were failures. I tried projecting the faces of clowns and imprinting them on spheres covered with photo-emulsion, but the result was simply a face on a sphere. I had also tried some rudimentary digital rendering to stretch the portrait all around the sphere before actually painting it, but this became unreadable. It took me over six months to figure out that the way to make a face and a sphere coalesce was by using a simple grid translation from flat photograph to sphere, where the grid on the sphere is defined by its corresponding parallels and meridians. This was like, say, the reverse of making a flat map out of a globe. This system allowed the sphere to adopt and “absorb” the picture plane of the photograph, such that the clown’s face becomes distorted “naturally” as it is transposed to the spherical format; but also a complex pictorial space is articulated in the result, where the face seems to be both on the surface and within the volume. This effect is surely impossible to visualize through my description; one really needs to look at the paintings. In this sense I can say that the clownspheres do work. The experience made me reconsider the extent to which the appreciation of a painting is influenced as much by fundamental optical and epistemological parameters as by cultural conditions that are entirely contextual. I also realized that I had camouflaged the full potential of the clown-icon behind the spherical distortions. So I figured I would confront the matter square-facedly, and this is how my return to the flat canvas came about. While the spherical paintings were meant to compile the pictorial and the tangible in the eye of the beholder, in the Clown series I set off to conglomerate the beast with the beauty, to fuse the debased clown-icon with as elegant and seductive a painterly manner as I could. Elegance would be staged by way of the minimalist ideal— a flat, square, human-proportioned format. Seductiveness would be articulated through a luscious layered technique reminiscent of Venitian portraiture. I can explain this as a sort of push- and-pull strategy that painters have made use of since Giorgione’s La Vecchia and up to Hans Hoffmann. The portraits in this series were all done in a similar fashion, irrespective of whether the clown is sad, anguished, melancholic, cheerful, exultant, curious or annoyed. The particular psychological state did not affect the formal treatment, but each one of them is emotively powerful for that very reason—for all the wild exuberance of the clown, the paintings are sober and dignified. You end up suggesting that for me “emotion is a matter not only of accent but proportion”. I would dare add that every aesthetic quality in a work of art is a matter not only of accent but also of proportion, including aestheticized emotion. — I agree, but in retrospect I should have developed a bit more on that idea of proportion. With the use of that term, I meant to refer that something proportionate is commonly harmonious, while something out of form is considered to be in disagreement with its environment—whether one is speaking of a cultural sphere or natural environment. I’m interested in this idea of historical context, and how it has an impact in your work. Earlier, we were discussing your experience as an art student in Los Angeles, California, and now you’ve introduced another context, that of art production and reception in New York City. That was in the early 1990s. Most recently, art critic Jan Avgikos curated the exhibition I AM Walrus (2003) at Cheim & Reid in New York, where she brought together not only the Nauman’s Clown Torture, which you’ve mentioned, but also a number of artworks that portray or reference clowns. Avgikos claim was that the clown was an oddly prominent figure in contemporary art. You were working on your series of clowns much earlier than this, and having difficulty in locating a variety of portraits and images of clowns that you could study for your paintings. Today, with access to Internet a simple image hunt in a popular search engine like Google.com provides more than 200 different portraits of clowns in a matter of seconds. The access and use of source materials has given much more weight to research-based artistic practices. The archive that is the Internet itself, in addition to the many archives that it takes you to, redefines image appropriation in contemporary art. Our relation to something like media images—presented and circulating in television, Internet, newspapers and magazines—is read entirely in a new vein. Drawing from “The World This Week” section of the Economist magazine, your newest body of work, The Economist Shuffle, uses images that may or may not be familiar to your audience, but that ultimately have a wide distribution worldwide. A thumbnail photograph of this weekly magazine turns into a timeless window unto the world when you picture them. I feel that this shift in meaning occurs only due to the sensuousness of materials, say, of paint, and that it could be said to be a turn from documentary to narrative, from news to history. Can you talk about your choice of source material, and your interest in re-presenting these images with paintings made, of all things, with egg tempera on wood? — My choice of images and visual material to work from had always been focused on a single theme, respectively, within each series, and the choice was always calculated to fit clearly within the narrow scope of the group. The Economist Shuffle departs a bit from that formula in the sense that I have allowed myself to paint pretty much anything that happens to be reproduced in “The World this Week” section of The Economist magazine—it can be a portrait, a landscape, a grouping or whatnot…. Why The Economist? Because it is what I read, and it is there that I kept seeing images that attract my eye. The consideration at hand, in selecting an image fit to paint, was simply that I felt, for whatever reason, that the image could become a good painting. This is as “gutsy” as I get, sort to speak, when it comes to guiding my artistic choice through “feeling” or “impulse.” Why does an image look to me that it can be a “good” painting? I can rationalize it by way of the formal aspects of the image or the art historical references that it may arise, but ultimately my sense can only be proven by actually making a good painting out of it. Of course, the images in The Economist are not simply eye-catching pictures. They are illustrations of events that have historical, political, moral weight. But the picture does not articulate that by itself— it’s our understanding of the event illustrated that carries the judgmental content. Once transposed to the realm of art, this dynamic shifts because the image itself becomes the focus. The fact that we give our attention to paintings can be manipulated to call attention to unpleasant issues that would otherwise remain sidelined. Such was the case of Gericault choosing to paint The Raft of the Medusa; Manet’s choosing to paint The Death of Maximilian, and Richter choosing the Badden-Manhoff as subject. Gericault composed The Raft based on reports of the disaster such that he devised a masterpiece in the vein of heroic history painting. Manet lifted his Maximilian straight from a newspaper etching and turned it into a pretty bland composition that —intentionally—had nothing heroic about it, either in form or in content. Richter did as much with newspaper photographs of the terrorist group. Warhol’s case is the very opposite. The Accident paintings, for instance, do not represent a particular event which we, as spectators, need to be reminded of. The source photographs were cropped, turned, solarized, multiplied to end up looking like abstract expressionism. If anything, Warhol was mocking the young Ab/Ex’s who spent their talent mimicking the painterly “accidents” cultivated by their elders. The Picture Planes of Vija Celmins also elaborated, tongue in cheek, on the prevailing ruminations on the subject by Clement Greenberg. The Economist Shuffle does not quite fit within one or the other strategy. It is neither a commentary on the events depicted or a rhetorical irony on the state of the art. Perhaps the series is more akin to the XVIII century notion of the picturesque, whence painters chose to represent a landscape because the landscape looked already like a painting. Kant adopted this notion for his Critique of Judgment, where he suggested that we find beauty in the world because we look at it as though it were a work of art. Still, I don’t mean to say that the pictures in The Economist are works of art for me; they become art only when they become paintings. You say that the shift from thumbnail picture to timeless window in The Economist Shuffle is due to the sensuousness of the materials. I would like to add here that the painter’s materials are not sensuous on their own (in the relevant artistic sense). They become sensuous within a painting; and this sensuousness lies in the ways the artist achieves—through labor, technique, talent and luck—the effects that make up the painting. — For a moment, I thought this would turn into a conversation of the history painting. But again, you introduced a philosophical reference and opened up a larger discussion on aesthetics rather than solely art history, that is, on experience of art and not only themes or artistic processes, the latter, which I have clearly insisted on. See, I wanted you to talk about what it means to make art, for you, and how your ideas inform your practice, how your works are created, and throughout this exchange you’ve generously explained this quite lucidly. The generosity I am taking about lies in the detail and accuracy of your descriptions. Your paintings have this sense of clarity, too. Specificity is almost an obsession it seems, and this is not only in your use of language. It is also visible in your work through sources referenced, chosen mediums and the type of processional quality in your series (or topics). As I mentioned at the beginning, I met you as a critic first and a painter next. Let’s talk a bit about this, about writing, whether you see this as part of your expanded artistic practice or clearly mark distinctions between your work as an artist and your role as a critic. Hmm, maybe this is phrased incorrectly, as if I were interested in the semantics of this. I am not. I am more curious in learning about your interest in philosophy and in writing as an intellectual pursuit. — On the contrary, I believe one should be concerned with semantics (and syntax) when making art and also when talking about art. As makers, spectators and commentators we may differ in our assessments and expectations, but we should at least strive to make some sense when it comes to our judgments. Otherwise art is overwhelmed by fad and whim. One comes to art in youth, shown to admire artworks as feats of human prowess. Later on one learns to respond to art’s perceptual cues and identify its historical codes. In developing our own aesthetic sense we are often perplexed and mystified, as much by particular artworks as by other people’s reactions to them, and we may overcome these frustrations by educating ourselves towards discerning the authentic from the posed, the complex from the messy, the refined from the simplistic. Eventually we get to read the artworks we encounter; often we appreciate them, sometimes we draw joy from them and even get to admire a few of them. In the end, when we claim to have developed our own aesthetic judgment, the art we do admire must also withstand our critical scrutiny. As I already mentioned, studying philosophy was for me a means to overcome the obfuscating dictates of art-school “theory”. I never intended (nor believed I could) become a real philosopher, but at least I’d be able to study the classics, get a more rounded overview of our intellectual heritage, and learn about approaches to art that would foster my development as a painter. I was much encouraged by the Gombrich’s Art and Illusion, Nelson Goodman’s Languages of Art, Richard Wolheim’s Painting as an Art, to name a few of the books that, I believe, every aspiring painter should read. I started writing on contemporary art some years later as a result of another personal frustration: Throughout the 1980’s I had been a fan of the films of Peter Greeneway. They were complicated and enigmatic, yet one could interpret them in some satisfying way. However, in Prospero’s Books (1991) Greeneway dumped narrative altogether and came up with a capricious and pretentious mishmash of Shakespearean verse delivered through a collage of vignettes shot and altered digitally. I was extremely put off by the director’s abuse of the viewer’s good faith, and realized there is a point at which difficulty becomes gratuitous and intractable. My friend Gary Kornblau encouraged me to set my ideas on paper for possible publication in his magazine, Art issues. Of course, when you write them down, you realize how blurry your thoughts are—writing allows you to process them into coherence. I gladly took up the challenge of justifying my judgment through the art-review format (where description, contextualizing, argumentation and judgment must be condensed to very constrained lengths); it forced me to be consequential with my beliefs and expectations about art, and to somehow advance my aesthetic education. While in Los Angeles, criticism was for me a personal endeavor, but when I moved back to Mexico City in 1993 my writing took a more activist tone, in the sense that I believed I could contribute through my writing to the development of a less paroquial, more engaging art community. Aside from traditional and contemporary art, I was allowed to write on cultural politics and policies—which was a lot of fun—for the foremost local daily, Reforma. Nonetheless, I did not alter my priorities in regards to my own painting. To answer your question, I have kept the two disciplines clearly apart. Ultimately, if need be, I would hope my writing may eventually complement the public appreciation of my painting, and it would be a failure for me if it were the other way around.